Place ice cream in a large glass. Pour brandy into a small glass. Carefully touch a lighted match to surface of brandy to ignite it. 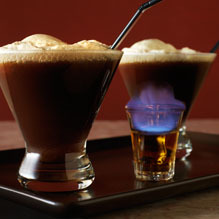 When flames die down, pour brandy over ice cream and fill glass with beer. Serve with a spoon and a straw.